SimpleSoft continues to assist developers with Add-on Test Suites. Built for the SimpleTester platform, the add-on SNMP Test suites provide semantic validation for specific vertical industries. These add-on semantic test suite modules are designed for specific SNMP MIBs and check both the underlying instrumentation and the inter-relationship between MIB variables against published RFCs. The modules run within the SimpleTester or SimpleTester for Workgroups products. 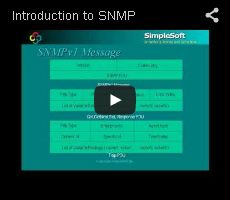 The SNMP Test Suites are separately priced, optional test suites that are offered in addition to the MIB2, RMON and SNMPv3 test suites that are included with the SimpleTester products. SimpleSoft, the industry leader in SNMP Agent Testing, has teamed up with Spirent Communications, a leader in packet generation, to create a complete SNMP Test solution for the SAN industry that verifies both SNMP protocol compliance and the accuracy of counters in popular SNMP MIBs. The base SimpleTester product provides syntax checking for all SNMP MIBs, while scripts within the SimpleTester SAN MIB Test suite validate the accuracy of the variables in popular SAN MIBs like the Fibre Alliance MIB.